RodgerDavies had the most liked content! I’m intrigued but concerned; I thought DR1’s Sweden had the best snow banks of any rally game I remember - that said, it’s not a deal breaker if they’re not as good and I’ll wait to see before judging anyway. It was the C3 that was updated before, the 208 (recorded DS3 which is the same car underneath) this time. I really like this feature too, certainly hope it's not removed - there are a couple of stages where the distance is too short IMO and the finish boards are waaay too solid, but that's the only critique I have. Drove a few stages with RGTs yesterday, Monte Carlo in the Mustang and the 911 in USA and no other game has ever had me tip-toeing around so nervously. I've done 2 hour enduros in GTR2 before and felt less than after a couple of stages in this game. I was excited by the RGTs' inclusion, but it's surpassed my expectations (except for on tarmac) - would love to see this class expanded further in future packs. I could be wrong, but last I heard they no longer had access to the car they were going to use to record from but were looking for another. Regarding waiting a week for the final audio - no-one is forcing you to use it for that week. I for one would rather have it now with the audio being finalised next week than wait another week for the whole thing. Tried the M1 on gravel (USA) for a few stages yesterday and found it surprisingly controllable, it felt tamer than the RGT cars to me personally. To be honest, a lot of them do start on an evening or at night for one or two stages. I have no problem with them starting at a random time, it's just the single 'daytime' stage before the evening ones start that is frustrating to me. Well, that and the complete lack of communication about the issue. Lol, I know, it's superb, but it is the developers' position to this day. VR addition will give them another “launch” shot at the game IMO and there’s nothing that shouldn’t be solvable before that IMO, but for those of us who already bought the game and bought into the “6 months of support” (of which one has already gone) I want to see a bit more comms about. +1 from me on how nice Monte is, really enjoying it, both the road feel on ice and the updated scenery. Also, the combination with the RGT class is a LOT of fun. However, it further emphasises the need for more time of day options please; there's only one weather option for daytime and only one for dusk - please give us more options during daytime - would love to see these stages in early morning light. 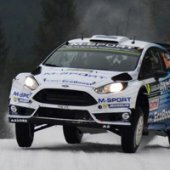 Where's it confirmed to be 50/50 between Rally and RX? Fully agree that we do need more time options. Early/late morning, noon, early/late afternoon before the sunset, dusk and night trio. And additional weather options for the times of day which currently only have one option.